Swimming is certainly not a modern sport. It has been known since prehistoric times and is nowadays one of the most popular sports in the world. Before being considered a sport, though, it has always been a popular summer pastime all over the globe and was practiced by many as a way to make a hot summer day tolerable. In this post, my aim is to look at swimming from an historic perspective and see what changes swimming went through before it became what swimming is today. We cannot know for sure, but I guess it’s safe to assume that swimming as a water locomotion activity was invented as soon as men realised they could walk. What we do know for sure is that rock paintings from around 10,000 years ago found in a cave in Egypt show people swimming, while written references date from 2000 BC, so basically since the beginning of the world as we know it. If in ancient times it was just a locomotion means and later on a recreational activity, swimming has evolved to become a competitive sport. It emerged as such in the early 1830s in England. Here is where the very first indoor swimming pools were opened to the public, St George’s Baths being one of them, and where regular swimming competitions were held. 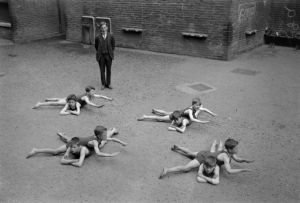 Little by little, swimming as a sport grew in popularity and more than 300 swimming clubs appeared across the country, which in 1880 led to the formation of a national governing body, called the Amateur Swimming Association. Since 1896, swimming has been featured at every modern Summer Olympic Games and the sport has evolved greatly since its inception. At first only men were allowed to compete, and women’s swimming was introduced into the Olympics in 1912. When it comes to swim styles in competitive swimming, there are four major styles: butterfly, backstroke, breaststroke and freestyle. Over the last 30–40 years, only minor changes have been made to these water moving styles. The most drastic change has been the addition of the underwater dolphin kick, which helps maximize the speed at the start and after the turns in all styles. The design of the swimming pools, on the other hand, has improved significantly over the years, allowing contestants to swim faster. The types of competitive events have also changed over the years. The butterfly style, for instance, was seen as part of the breaststroke until the 1956 Summer Olympics in Melbourne, when the first butterfly events were introduced. If we look at pictures of people swimming from back in the nineteenth century and compare them to some current day ones, the glaringly noticeable difference is the swimsuit. The popular two-piece suits from back then were very modest and included a knee-length gown and trousers to the ankles.